I have lots of piles of “stuff” in the Local History collection that were carefully arranged by a previous librarian or staff member. They had squirreled away fascinating documents and ephemera items in ‘safe spots’ or filed them away in an organisational system that only made sense to them. So now I am the lucky one who gets to sort through the “stuff” and make it accessible to you. Regardless of how time consuming it is, I always manage to uncover something exciting. For example, the other day I discovered a poster that outlined the South Perth Road Board’s by-laws in regards to Public Parks & Reserves (believed to have been produced between 1922-1956, the second period during which the City was classified as a Road Board). One clause boldly stated something along the lines of ‘goats on leash are not permitted on any Park or Reserve within the boundaries of the South Perth Road Board’. I don’t think we would see too many leashed goats being taken for an afternoon walk around South Perth these days, but in the early 20th century this could have been highly likely with the use of South Perth’s foreshores for agricultural purposes. Yesterday I sat down with yet another pile of “stuff” and uncovered this little gem – a tramway time table for the ‘South Perth local service’ between Mends Street Jetty and Como. This could have been produced at any point between 1926-1950 (the Mends Street Tramway Extension was officially opened on 8 October 1926 and the tram service was discontinued on 10 June 1950. Also, Foy & Gibson’s Pty. Ltd. is in existence on Hay Street during this period, as are the offices for State Ferries and West Australian Government Tramways, situated at 514 Hay Street, Perth). It looks as though this is only half of the original time table (with evidence of tearing on the upper left corner of the passenger fares side). If I ever uncover the other half, I’ll be sure to share! The former Pagoda Ballroom was originally built as tea rooms in the early 1920s in response to the popularity of Como Beach. It was built for a Mr & Mrs Gordon to operate. As described by John McLay ‘ … we’d go down to the Pagoda. And Mr and Mrs Gordon would be sitting out there in their evening frock and dress suit and about four customers inside, all in their dress suits. You know, it was really posh, but it didn’t take on’. Infrequent tram and ferry services from Perth proved to be problematic for business and the Depression was to have an effect on the tea room trade. The building was used as living quarters for soldiers serving in WWII. When a Victorian army veteran who had quartered at the Pagoda revisited Perth, it was discovered that notches carved out of the window sills served as locations for rifles to be placed through. 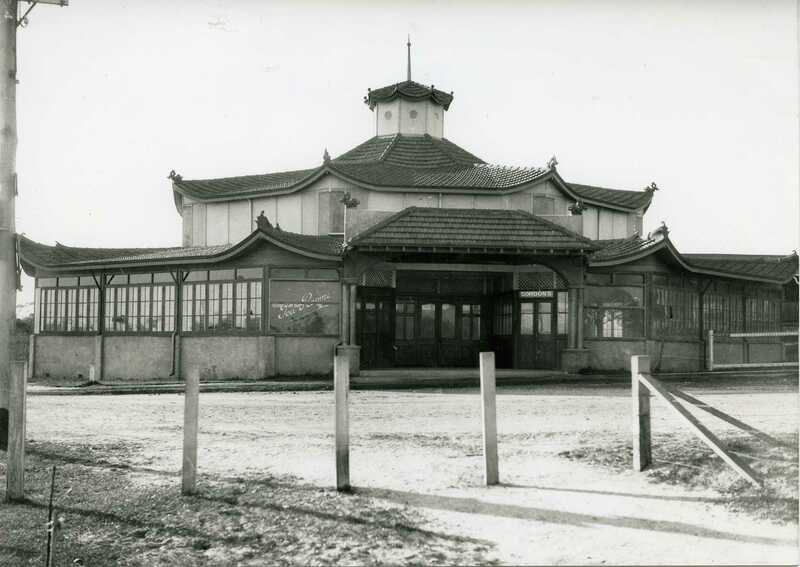 After WWII the Pagoda was reopened and became a popular ballroom and reception centre. Like many other ballrooms it was unlicensed, however alcohol could be found. Kegs would be brought by attendees and the taps passed through a window. The Pagoda hired out the jugs. Over the years the building was also used as a venue for roller skating, jazz music, ballroom dancing and weddings. 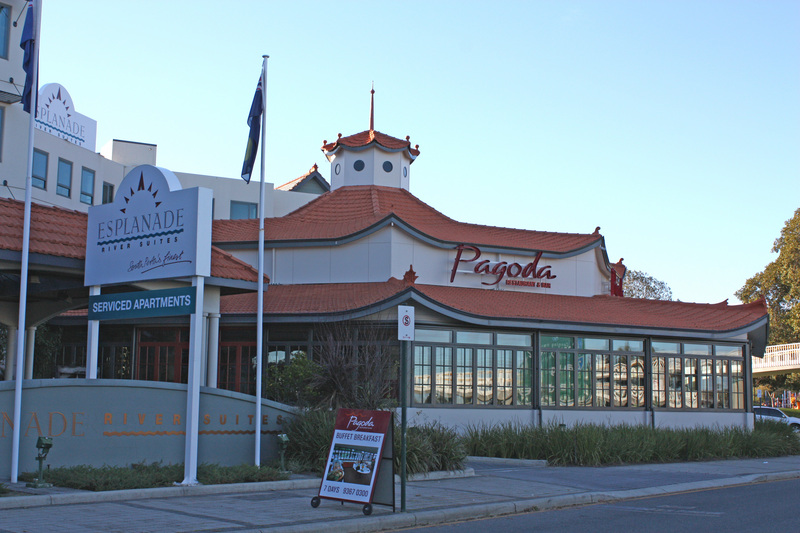 Today the octagonal building is known as Pagoda Restaurant and Bar. The pagoda style roof and the building’s exterior has been restored to its former glory in the unique Edwardian Oriental style. I think I maxed about 40 km/h along Labouchere Road this morning on my way to work…even though I was practically the only car going in that direction. The drainage (if there is any, wild guess here) along that road is pretty crummy so your car practically swims to where ever you are going. South Perth had some wet & wooly times back in 1926, when the Peninsula area was flooded. Shoes and socks were taken off, and skirts and pants hitched up to cross the jetty to catch the ferry to Perth. Kids had a great time and got their rowboats out and went for a paddle down Suburban Road (now known as Mill Point Road). Here’s hoping that the Como Beach foreshore is holding up OK!